My husband and I bought our first home in October of last year and are finally wrapping up most of the remodeling! I can be a little bit of a clean freak, so moving into a home that was almost 20 years old that needed a lot of work was a little hard for me. As a food blogger, everything in our home revolves around the kitchen. I think I spend most of my day in my kitchen cooking, doing dishes and feeding my family! I knew I wanted to have a beautiful kitchen that was perfect for gathering in! This is what our kitchen looked like the day we moved in. It may not look too bad in this picture, but trust me, it really was! Being pregnant, I couldn’t even go in, let alone cook in it. It smelled so bad! 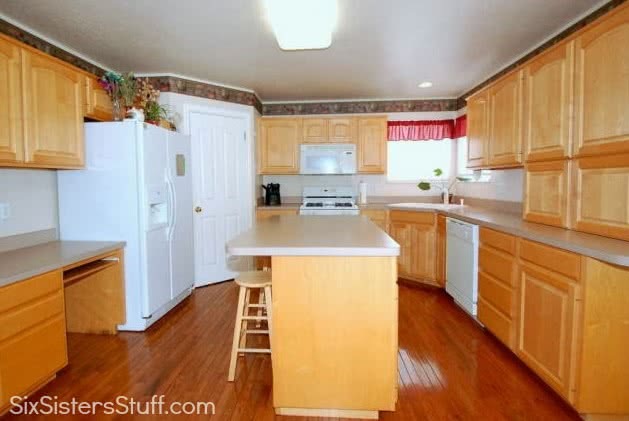 The countertops were a pinkish purple color and the walls were peach. I feel like it just looked so small because of all the heavy oak and wallpaper. I finally convinced my husband that we could just tear it all out and start over! We definitely aren’t the handiest people in the world, so if we can do it so can you! 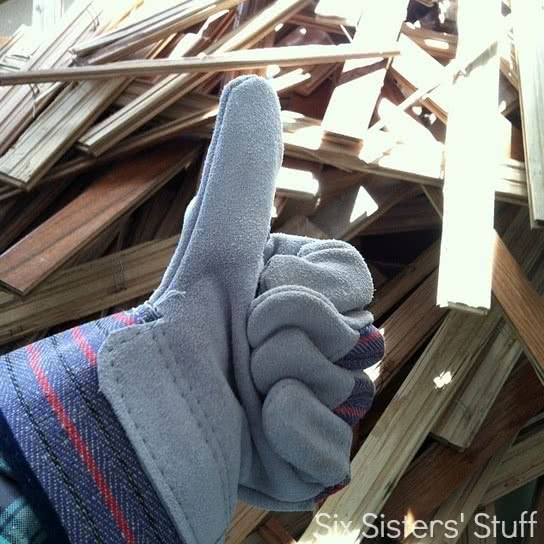 You can follow along with our home remodel process here! After we had decided to remodel the kitchen, we got to work with some of our favorite companies to transform our kitchen! I can’t say enough about these wonderful companies! They were all absolutely amazing to work with and offer the highest quality products for your home. 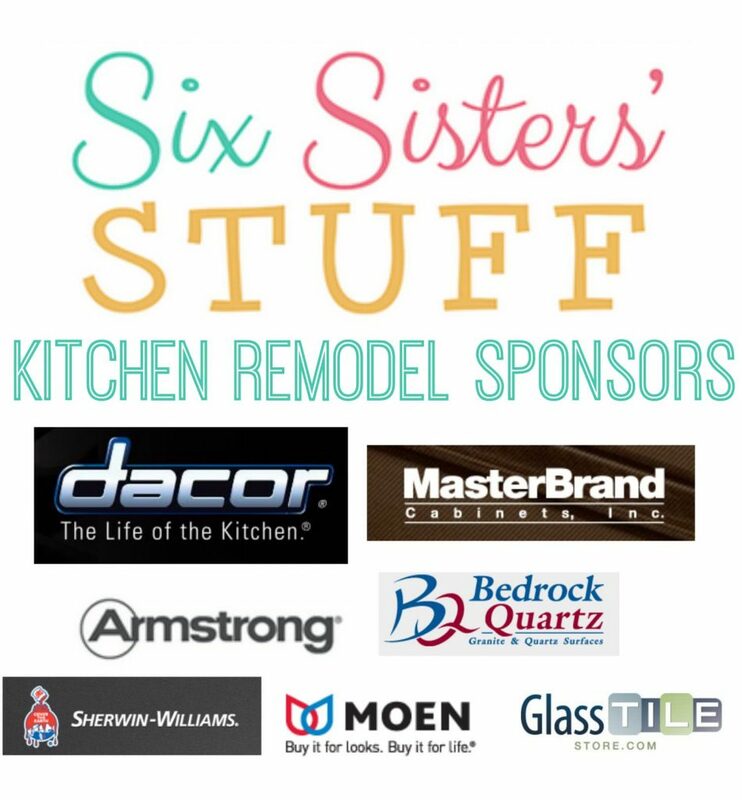 I will be sharing more about each of these sponsors throughout the week and you will be just as smitten as I am! We started our remodel by tearing out the flooring. I know, I am a terrible person for replacing real hardwood flooring with laminate, but it was the perfect choice for our family! I wanted to have the same flooring throughout the same level of my home, so we decided to take out all the carpet and wood and put down new laminate that was more our style. But before we could put down new flooring, we had to remove all the old flooring. 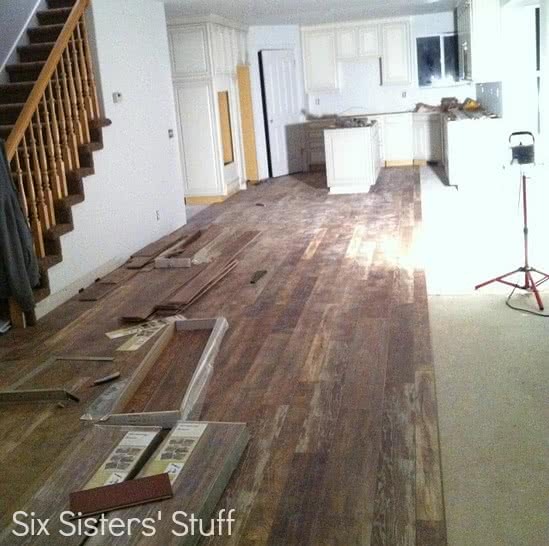 If you have ever removed hardwood flooring, you know how difficult it can be! Each individual strip of wood had been stapled and nailed into the floor multiple times. Haha it wasn’t going anywhere! After everything was removed, we got to painting! My husband bought a paint sprayer, which ended up being the best investment ever for all the work we’ve been doing on the house. 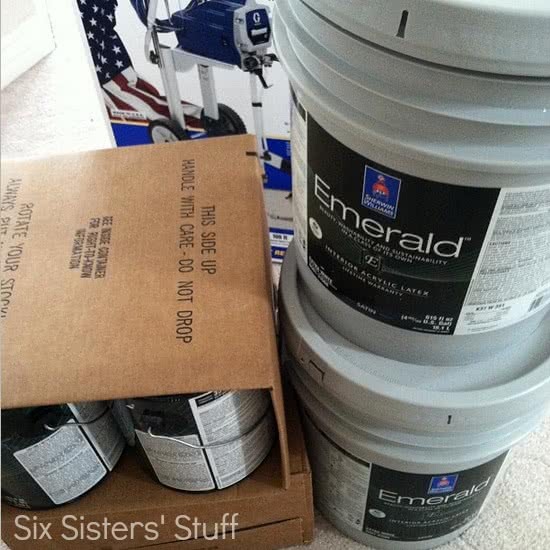 I’ll give you more details on the gorgeous Sherwin-Williams paint we used later this week! Once the paint had dried, we were ready to install our beautiful MasterBrand Cabinets. MasterBrand was absolutely wonderful to work with. We worked one on one with a designer who helped us find the best way to utilize every square inch of our kitchen! Later this week I will show you all the plans and the process we went through to transform our kitchen with MasterBrand Cabinets! 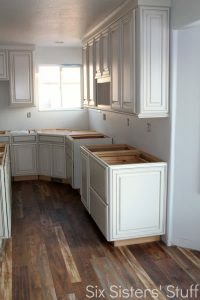 We made quite a few changes to the design of the kitchen with the cabinets and I have more space than I know what to do with! I think we doubled the amount of storage this kitchen had before! After the cabinets were in, we laid the new laminate. I seriously am obsessed with this Armstrong Architectural Laminate. Everyone who sees it thinks it is real wood. It is absolutely gorgeous! And the best part is, we did it ourselves! It was so easy to install and has changed the whole look of our home. Later this week, we will be sharing more details about our flooring including a video of how we installed it! Now that we had our flooring and cabinets in, we were ready for countertops! 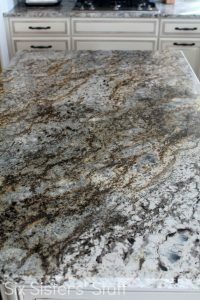 I knew without a doubt that I wanted granite countertops and knew that Bedrock Quartz was the place to go. They had such a huge selection that it was so hard to pick a favorite, but I absolutely loved the granite we selected! Isn’t it gorgeous?! I’ll share more details on selecting granite this week! Of course a kitchen remodel wouldn’t be complete without a new sink and faucet! 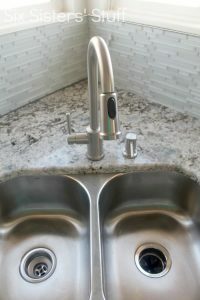 Our Moen faucet and sink go perfectly with our new kitchen! I can’t even tell you how wonderful it is to have a new, clean sink. The sink that was in our kitchen before definitely was not sanitary to be washing dishes in. I will just leave it at that! 😉 Haha! Now that everything else in the kitchen was ready to go, it was time for appliances! I knew I wanted stainless steel appliances. There are so many stainless steel appliances now, but I wanted some that were beautiful and durable. 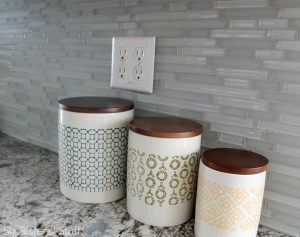 Dacor has the most amazing selection of appliances and as soon as I saw them, I knew I had to have them for our kitchen! I will tell you all about these wonderful Dacor appliances later this week in our kitchen remodel series! We searched high and low for the perfect backsplash to tie everything together. We found the perfect tile from Glass Tile Store that was easy enough for us to install ourselves! All that was left was to add a few finishing touches! 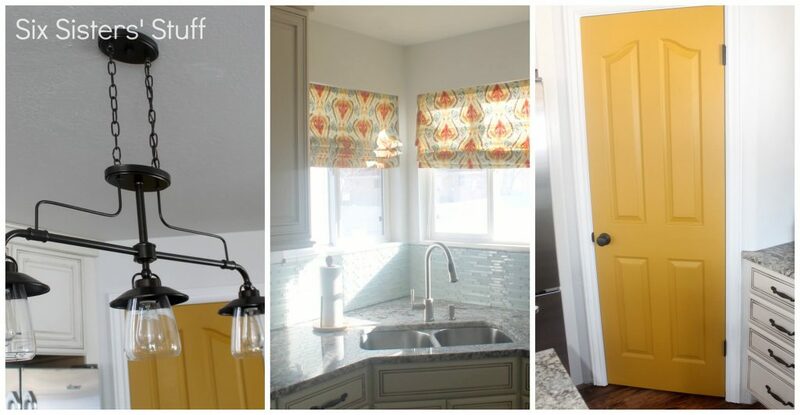 We installed a new light, hung some DIY fabric roman shades and painted our pantry door. Phew! Sorry that was such a long post! Stay tuned every night this week for more details and information on our kitchen remodel! Where did you purchase the light? The one in the last set of pictures. Thanks! Looks gorgeous! WOuld love to know what kind of paint sprayer you bought? Love the last picture of the light fixture! I have been looking for one. Care to share where you found that gem? Hey Alice! It is Allen + Roth brand from Lowes. :) Thanks for asking! Which laminate did you use for the floor? They have so many to choose from. Thanks! Hey Nancy! Here is a link to the flooring: http://www.armstrong.com/flooring/laminate/woodland-reclaim-textured-timbers-old-original-warm-character-wood-plank-L3102/floor-135347.asp Thanks so much! Hi Elise! I'm neck deep in remodeling our home! Love, love, love your taste! I've been looking for a cool glass back splash so I'm off to go visit The Glass Tile Store now. Thanks for sharing! Do you have a link for making the Roman shade? Love your kitchen! We just did our kitchen renovation as well, http://www.pinkbears.ca/index.php/item/513-now-that-we-ve-moved-in including a wall removal between the living room and kitchen/dining rooms - it's so much more open now, and we can have up to 16 people dining in our new multi-purpose room! :) I love the tile backsplash that you used - that's the one thing we haven't yet completed in our kitchen, as we've been waiting for the *right* tile to come up (in our price range). Home Depot has really good sales occasionally on exactly the tile we want, and we're waiting for it to come around again. In the meantime, we might just change our minds! I love the style you have here. I also really love those curtains - did you do them yourself? Tutorial? Most places that design kitchens can do any redesign you have in mind. They have a lot of ideas for any type of handicap to make your kitchen accessible.